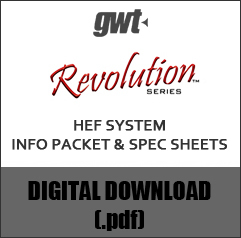 The Revolution HEF System is the flagship filter by GWT. Revolution HEF Systems are both powerful and effective in removing solid particles and contaminants from water. 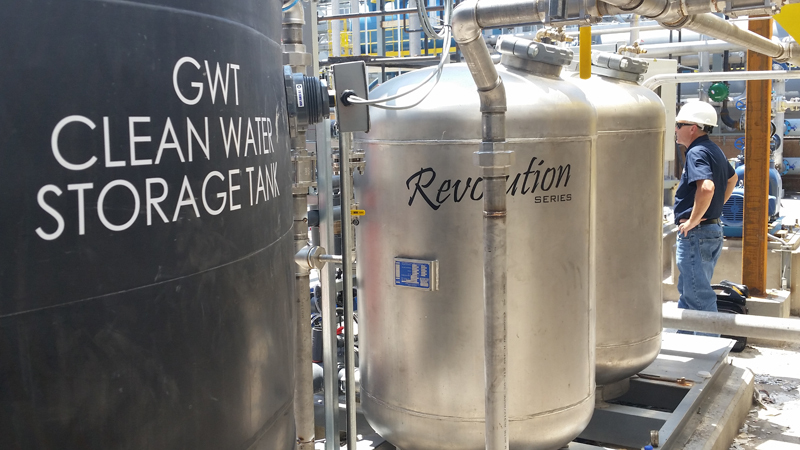 The automated Revolution System uses a Cross Radial Flow filtration method that removes particles from water down to the sub-micron level (0.5 µ nominal rating). Review the Case Study here. The Revolution HEF system is a powerful and effective water filter. In a side-stream installation that treats only 5% of a system's flow rate, particle counts (TSS), particle volume (PPM), and microbe levels (bio-film) of open-air water loops are commonly reduced by more than 98% in as little as 30 days. In a closed loop setting, the removal rate is usually higher. GWT's fully automated HEF Systems use several layers of non-dissolving, non-toxic sand and gravel media to trap particles. Depending on the size of the HEF System, when a certain measure of particles (TSS) are trapped in the vessel, the HEF System will clean and restore itself to normal operation without any manual intervention. Designed for mechanical systems and other industrial applications, Revolution HEF Systems provide filtration that helps reduce the use of water and energy while increasing the performance and output from the process and/or mechanical systems they serve. The GWT Revolution is a fully automated system that provides around-the-clock protection against pitting, corrosion, and bio-fouling to keep mechanical equipment running effectively and efficiently with minimal downtime and maintenance. Save Water: Revolution HEF Systems only require half of the backwash water volume of a conventional Sand Filter, and about five-times less backwash water volume than centrifugal separators purge while running. Cleaner water also means less blow-down and greater water conservation. Save Energy: With its low-compression, high-flow rate media, Revolution HEF Systems use 50% less energy than a conventional Sand Filter, and almost 90% less energy than an in-line centrifugal separator or cartridge, bag, or disc filter for treating the same water loop. Less fouling also equates to more efficient thermal transfer in heat exchange applications. Save Time: With its sub-micron performance and automated control system, Revolution HEF Systems keep systems online and operating smoothly. Routine maintenance, and repair (labor) requirements are significantly reduced, and the extended life of machinery, and other equipment will lead to less downtime. Save Money: By saving water, time, and energy, there is no denying that operating costs will go down. The investment and long term performance of a Revolution HEF System is also rewarded with a short term payback period. What is High Efficiency Filtration?